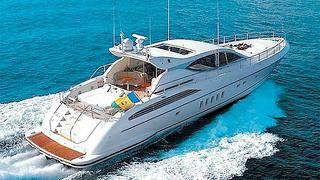 Joan Plana at World Yacht Group in Los Angeles sends word that he's taken over the central agency for sale of the 24m Leopard motor yacht Dolce Vita II. Built by Arno in 2006, she was most recently refitted in December 2012 and accommodates seven guests in three staterooms. Twin 1500hp MTU engines give Dolce Vita II a top speed of 35 knots and her shallow draft makes her ideal for cruising the Bahamas. Dolce Vita II will be on display at the Miami show, asking $1.49 million.